Reminiscent of the Sega Mega Drive Collection we’ve covered a few months ago, comes Tanglewood. 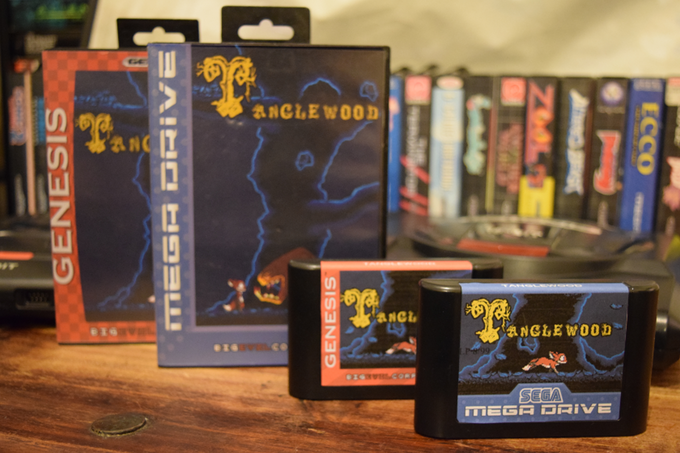 Like an all too familiar glitch in the system – but one we’re happy to have met – Tanglewood brings with it all that we used to love of the Sega Genesis (or Mega Drive as it was known outside of North America). It’s the treat-after-homework nostalgia of the 90s, retro done so well it could have been a relic dusted off from some shelf or other. And yet, it was developed as recently as last year by an unknown developer who wanted to challenge himself. And boy hadn’t he met his match. Matt Phillips, developer of Tanglewood said in a recent interview with the BBC; “I’ve had more repairs on this thing than I can count.” This ‘thing’ was an actual 1993 Mega Drive dev kit, running on Windows 95 PC Pentium 2, while he wrote the game’s code on Notepad++. He worked with the system’s memory limits to give the game as much of an authentic feel as possible, resulting however in a number of breakdowns expressed during his interview. His Kickstarter campaign pledge of £48,000 was met and overshot by £12,000 as he ran this one man show, ordering Tanglewood cartridges from a Chinese manufacturer and had unnamed Canadian help to produce the circuit boards. Slowly but surely, the game took shape. Tanglewood is set in a fictional world, or so its website states in the first few lines. We meet Nymn, a cute foxlike creature who got separated at sunset from the pack and now has to face the horrors of the night on his own while trying to make it back to his underground home. You could probably count the pixels on your left hand, as this 16-bit adventure takes you (both right-to-left and left-to-right) through a forest full of demogorgon look-alikes. You jump, push, pull, roll boulders and ride scary beasts till dawn, and safety. It’s a nostalgic thrill with a cute storyline and characters that will bring back fond memories. It is available for pre-order if you have an old console you can hook up to a TV, or you can wait until he ports the game to a PC. Your choice. So what are we really looking at in the near future? We think there will always be a base for new games. Supercomputers will keep churning out lifelike characters, plots will become ever more complicated and we will keep seeing sequels until we can’t bear to see sequels anymore – and there will always be a market for this. After all, not everyone remembers the golden 90s. But for the most of us, the generation who is still around and are still young as we remember the good old SEGA days, we will keep looking back, half-yearningly at the warm feelings we had as we ran to our console when our mothers and fathers allowed us to. And if there are more developers like Matt Phillips who are willing to go the extra mile to offer something familiar and yet completely new, they will find that there will always be a market ready to receive those games. Perhaps SEGA need to revise their QA department however. It seems like when Phillips went knocking at Sega to see if the company would be interested in officially licensing the game, he was told that they don’t have the processes for quality assurance on Genesis/Mega Drive games anymore. Pity.